The first Mudd Gallery show of the 2018-2019 school year is set up and ready to be viewed! The show, History of the Hysterical, is a grouping of works by Lawrence student Meryl Louise Carson. The opening reception is on Friday, October 26th at 4:30 pm. Carson’s exhibit will be on display from October 23-29. 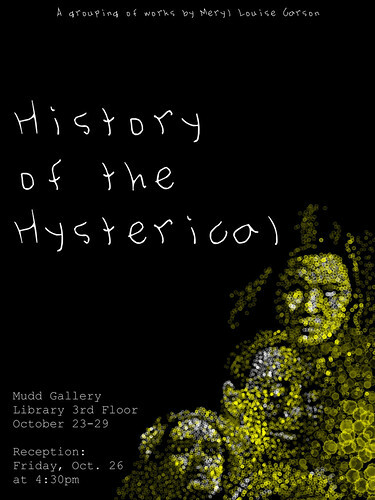 The Mudd Gallery is located on the third floor of the Mudd Library. 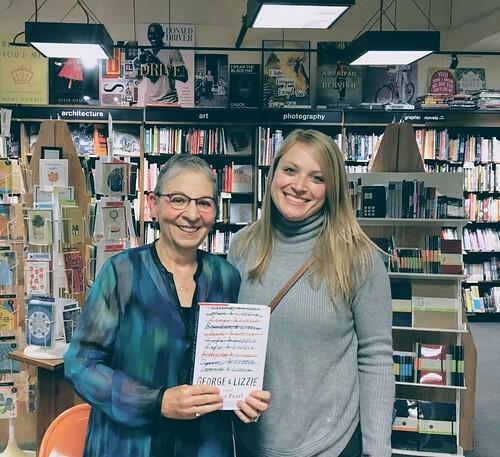 Editor’s note: We invited Lawrence alumni who have gone into library work to share with us what they do and how they got there. Here’s another in a series. Envy. I admit it. That’s what I feel when I think about students in college and graduate school today considering entering the library field (including my son, a current student at Lawrence). Not to be too “back in my day” about it, but when I attended Lawrence in the late ‘80s I can positively state that being a librarian never entered my mind. Don’t get me wrong, I loved my local public library in West Bend, Wisconsin and was a frequent visitor to my school libraries and even the good old Mudd while a student at Lawrence, but it’s hard to describe to students today how much technology and culture have transformed libraries (and the role of the librarian). If I could have majored in “Liberal Arts” at Lawrence I would have. I was interested in everything and took as long as I possibly could to pick a major, and even then chose one that spanned two disciplines (back then Lawrence had an Anthropology/Sociology department). Plus I threw in an Education minor and earned my teaching license in 7-12 Broad Fields Social Studies. Lawrence made it very difficult to leave the world of learning, so even though I was prepared to enter the classroom as a teacher, I decided to extend my studies into graduate school and entered the Masters in Sociology program at the University of Wisconsin-Milwaukee, where I completed the program with a thesis based on original research on the topic of urban education. 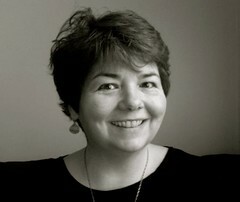 After getting married and moving to New York City so my new husband could pursue graduate studies, I entered the world of publishing as an editorial assistant for an editor working on academic titles in the fields of Sociology and Philosophy, while I spent nights teaching GED and ESL classes at a non-profit community organization. Upon returning to Wisconsin three years later I took a job as an academic advisor with a program called Upward Bound, run out of the University of Wisconsin-Sheboygan campus and three years after that I became pregnant with my first child and found myself moving again so my husband could pursue his career. Whew. Taking time off from paid employment to be a stay-at-home parent to my two children was definitely not time wasted (in fact I highly recommend it if money and circumstance allow), but it did create a sizable hole in my resume when I decided to return to the work world when my younger child started Kindergarten. I knew I wanted a career again, a profession that would be part of my identity and allow me to fulfill my potential. Traditional teaching was obviously an option, but I didn’t have the same passion for it that I did when I was younger. I considered other roles within the education field, such as counselor, or reading specialist, because I had really enjoyed the one-on-one relationships I built with students when I worked for Upward Bound, but I knew I needed to go back to school on some level to refresh my knowledge and credentials before anyone would hire me. I turned to the website for the UW-Milwaukee Graduate School to see what programs were available that might allow me to combine taking courses in-person with an online component, because I still had young kids and driving 35 miles from my home in Racine, Wisconsin was not always possible. It is there, while perusing the various programs, that I first laid eyes on the School of Information Studies (SOIS). Have you ever had one of those moments where everything just came into focus? I was excited and surprised. Course titles like The Organization of Information, Information Access and Retrieval, Metadata, and Information Ethics intrigued me. What sold me was the ability to combine a Masters in Library and Information Science (MLIS) with the certification for a School Library Media Specialist license (K-12) by taking courses like Library Services for Children and Young Adults and Multicultural Children’s Literature. It felt like a great fit, so I enrolled in January of 2008 and never looked back. How had this field escaped my attention all this time? Well, a little thing called the Internet took over the world in the time since I left Lawrence in 1989, and libraries and librarians have been leading the way as innovators and navigators of this brave new world. Now I work as a Library Media Specialist (sometimes referred to as Teacher Librarian) in a public middle school serving more than 800 students in a very culturally and economically diverse community. I am certainly proud of the collection of books I have selected and curated over the years but I am not the English-major book nerd that is often part of the librarian profile. I approach my profession as a Lawrence graduate, a liberal arts nerd who is fascinated by and knowledgeable about many different fields and topics. I collaborate with my social studies, math, science, art, music, and even gym teachers as much as I do my English faculty. The online world is a wonderful and terrifying place for kids and adults and a large part of my value to my school is my ability to make technology and digital information accessible, manageable, and meaningful. I collaborate, I troubleshoot, I teach, I counsel, I provide inspiration and sometimes refuge. Every day is a different schedule and a different challenge. I get to know and serve every student and teacher in my building. I also have chosen to participate in my profession by serving on task forces and committees for the American Library Association (ALA) and the Young Adult Library Services Association (YALSA), which is just the cherry on top of my already awesome job because I get to know and work with amazing librarians from around the country. (I’m currently serving on the Odyssey Award 2019 committee which selects the best audiobook created for children each year). So, yeah. Do I wish I had found this career earlier? Absolutely, but I also recognize that the school library of my childhood was nothing like the one I work in today, so I just have to be grateful that I’m able to spend the 2nd half of my working life in a job I truly love (and also a little envious of those who can embark on a vital career in libraries right out of college). Welcome Week, one of our favorite weeks of the year, is coming up soon! We’re hosting or taking part in all kinds of events to welcome new students along with families and friends to campus. Below is a lineup of the major events! In addition to these, we’ll also be meeting with sports teams and Waseda students! Resources Fair, 11:30 am to 1 pm (Campus Center): Be sure to visit your soon-to-be friends from the Mudd Library at our table. 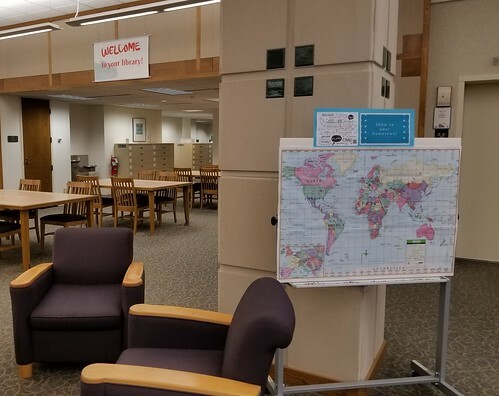 Parents, Family & Friends Library Drop-In, 1 pm to 3 pm: While new students are off doing activities, come to the library and make yourselves comfortable, wander around, grab a magazine or newspaper, relax in the Milwaukee-Downer Room, use our wireless, and sip some coffee or tea. Enjoy our library! Welcome to the Mudd Open House, 9 am to 12 pm: Stop by the Mudd and meet the people who can help you succeed. Not only can you find out about the library (both online and offline), take a tour, and enjoy some food—you can build with Legos, make origami bookmarks, play on the Wii, and more! It’s both fun and educational—and you can’t beat that. Getting to know the library presentations and tours, beginning at 1:30. Get off to the best start by learning all about what the Mudd Library can do to help you succeed. Each session will last approximately 20 minutes. Come to as many as you’d like! 2:00 pm Scores and CDs and Streaming, oh my! 2:30 pm, What’s the Mudd? 3 pm Scores and CDs and Streaming, oh my! 3:30 pm, What’s the Mudd? 4:00 pm, Scores and CDs and Streaming, oh my! Read the whole schedule on the Welcome Week events page. Want to know more about the library, visit our welcome students page. Welcome the Lawrence University, new students! We’re looking forward to meeting you! Your friends in the Mudd Library will be here for you all summer! How can we help? Need a space to get some work done? 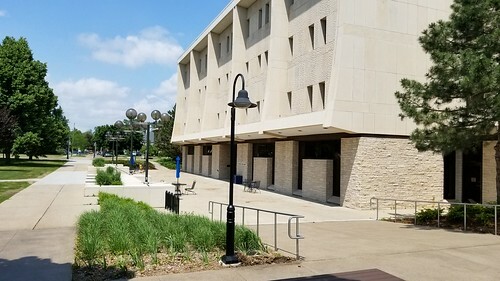 The library will be open Monday through Friday, 8 a.m. to 4 p.m. It’s especially quiet in here over the summer if you’re looking for a quiet place to get work done. Take a look at the many types of spaces in the library to find your favorite. Need something to read/watch/listen to/play? We have lots of popular novels, interesting non-fiction books, movies, documentaries, theatrical productions, CDs, musical scores, etc, that can be checked out! Off campus? Use your Lawrence login to access one of our many streaming media databases to watch opera from the Met, movies, documentaries, and more! Our friendly reference librarians are on call and ready to help Monday through Friday, 9 a.m. through 4 p.m all summer long! Off campus? Call, email, or chat! Our makerspace is available during all library hours to those who’ve been trained, and those who haven’t can contact makerspace@lawrence.edu to set up a training session. It’s available to all Lawrence faculty, staff, and students to enhance the creativity of their work here. We have a great lineup in our annual summer coffeehouse series! This summer, we’re calling it Mudd and Friends, as we’ll also be joined by faculty from around campus who’ll share some of their lesser-known expertise. August 8: Antoinette Powell, “What’s all this I hear about the Fox River? Who owned my house? What was Appleton before it was Appleton? The Mudd Library can answer these and many other questions with its collections and electronic resources. Get ready to dive into local history in the Mudd. Did you know that you can renew library items online? Just follow the following quick steps, and you’ll be on your way! 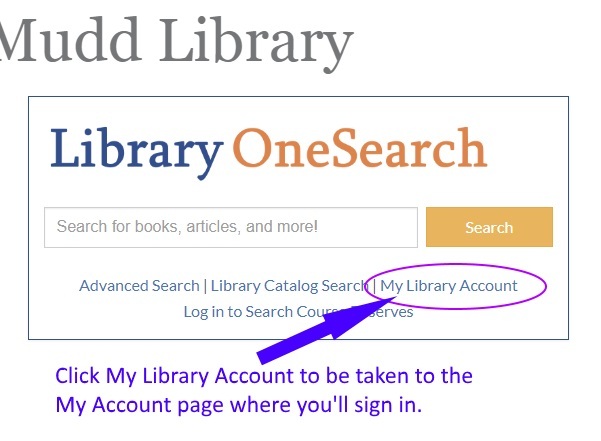 Step 1: From the library home page, click My Library Account (or just got directly to the My Library Account page). 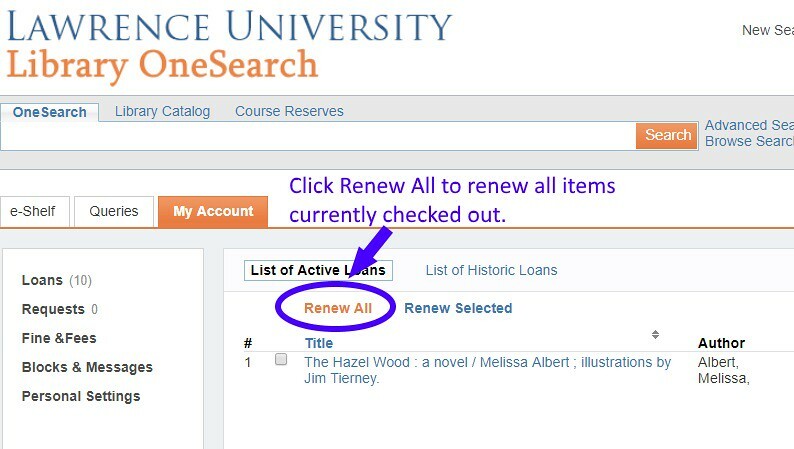 Step 3: Either click Renew All, or click the box next to the item(s) you’d like to renew, and click Renew Selected. And your items are renewed! Any questions or problems, contact the circulation desk at 920-832-6750, or email a member of our circulation department. So here’s my story. During my four years at Lawrence, I was always on what felt like a pretty clear path: I would get really good grades, get my BA, and then go to grad school. Senior year, I was nearing the end of that path. I had decided to explore journalism after a few years writing and editing for The Lawrentian. I was also armed with the knowledge that, despite working on an Honor’s Project in English, I did not want to pursue higher education in that subject because I did not want to be a professor. After a trip to New York City to explore NYU’s journalism program, I was totally disillusioned. I had a Rory Gilmore moment while there. I was used to being a sort of big fish at a small high school and then in the English department at Lawrence, but visiting a top journalism school in the Big Apple I felt like a single-celled organism floating in the Pacific Ocean. And I felt as spineless as one, too. In the end I graduated and then moved home with no plan. Through twists and turns, I found myself 18 months post-Lawrence doing the tremendously unsatisfying work of a classified ad salesperson at a newspaper in North Dakota. One day I was walking my dogs and listening to a podcast of the public radio show, To The Best of Our Knowledge (produced right here in Wisconsin!). They were talking about public libraries, and profiled a book called This Book is Overdue! which I promptly went to the library to check out. In pretty quick succession, I applied for grad school, moved to Illinois, and spent two amazing years at University of Illinois Urbana-Champaign studying library science and working as a graduate assistant at the Undergraduate Library. Yes, Lawrentians: they have one whole library just for undergrads! Big schools are so weird! Now, I am the Assistant Director at Shorewood Public Library. A few important things happened along the way to becoming a librarian, many of them at Lawrence. I’ll use these experiences to give you an idea of what a librarian does, at least this librarian. I didn’t have one of those highly coveted jobs at the Mudd, but my jobs on campus gave me what turned out to be relevant experience for what I do as a librarian. Editing at The Lawrentian taught me to work strategically with a team, focus my creativity and turn work around quickly for a deadline. Tutoring at the Center for Teaching and Learning taught me to communicate tricky concepts in easy to understand ways, lead by example, and engage the learner in the process. I call on the multi-dimensional education I got at Lawrence when someone asks me for help finding a definition of modernism in poetry, or finding information on African explorers in the New World, or when I select new music for our collection, or when I write and edit library policies and procedures, or when I have to clean up puke. If only I were joking. When a young woman asked me recently why people started writing books (I can’t make this stuff up), the librarian in me had the patience and forethought to answer her question as simply as I could (no library patron needs to hear a dissertation, but many want to give you one), but it was the Lawrentian in me who had the knowledge and confidence to answer. While a student at Lawrence, I worked in the music library under the supervision of faculty member, Paul Hollinger. At that time, it was a small collection housed in the conservatory, but we all ate up that collection like children in a candy store. Additionally, I was writing an honor’s thesis on Anna Bon, 18th-century composer and her flute sonatas, so I was getting a lot of library time both working in the library and doing extensive research myself. I studied flute with Ernestine Whitman, and both of us were very excited to be exploring Bon’s work. My advisor for the thesis was Professor Marjory Irvin, and she was the one who instilled my love of research, writing, and scholarly discussion. I came to love the hunt for information, and Professor Irvin helped me to understand that the process of research is often not a straight line from where you begin to where you finish, but that it is messy, that it is connected, that and it requires an ability to tolerate ambiguity. I think she was actually teaching me about life without me knowing it at the time! Following Lawrence, I began graduate school in musicology. I had a teaching assistantship and was on the path to complete a PhD in musicology. To supplement my income, I also got a job in the music library helping with the copy cataloging of sound recordings. Before long I started appreciating the breadth of a typical day in the library. When I would visualize my life as a musicologist, I saw a tube that was somewhat narrow but tremendously deep. When I would visualize my life as a music librarian, the tube was much broader and offered exceptional breadth but not necessarily the depth of a teaching faculty member. I know it’s not that simplistic, but what I learned about myself, from my visualization of the two professions, is that I needed a career path that offered me a full span of knowledge and exploration. Essentially, I needed a big sandbox that included music, research, expansive learning and service, and the ability to influence the canon. It seemed that librarianship could be a viable profession that met the requirements. In talking with a few librarians and exploring the job market, I decided to switch to the master’s in musicology, rather than the PhD, and apply for library school. I’ve never looked back. It’s been the perfect career choice for me. I work at the Oberlin Conservatory Library, and it is located on the campus of Oberlin College in Oberlin, Ohio. It was founded in 1865 and is the second oldest conservatory and oldest continually operating conservatory in the United States. Like Lawrence, Oberlin is a liberal arts college and conservatory of music, the best of both worlds! My daily work in the Oberlin Conservatory Library focuses on public services activities. I spend my days doing information literacy work, conducting research appointments as well as supervising the public services operations of our branch library. It’s a very busy library! After spending a great deal of time thinking about breadth and depth, my thoughts have changed. My work as a music librarian has afforded me the opportunity to become moderately knowledgeable across a domain, and deeply knowledgeable within a strand of that domain. It has been a profession with a continual learning curve as technology advances and changes. While at times it feels somewhat overwhelming, I appreciate the constant challenge that comes with an ever-changing landscape. I remind myself that I did ask for a large sandbox! I have thoroughly enjoyed meeting and working with a wide range of musicians and scholars ranging from the undergraduates in the conservatory to the budding rap artist to the chorus member in the Metropolitan Opera to the seasoned soloist who is looking for a bit of information for their award-winning CD. 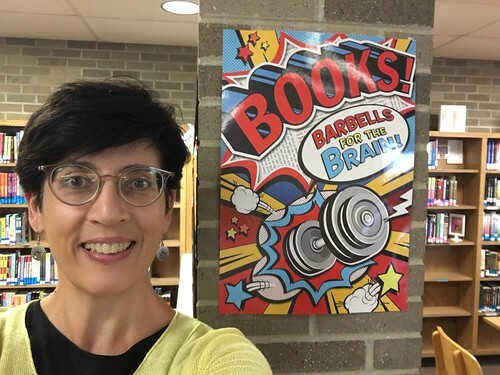 Librarianship is a meaningful profession that has given me tremendous opportunities, intellectual growth, and created a framework for my professional life. That care started at Lawrence where I was a first-generation college student who needed mentoring and guidance, and Lawrence took great care to develop me as a leader despite me coming from an economically-disadvantaged family. That spirit of support helped me to identify that I too wanted to further social justice in my library and research work. It started with Professor Irvin introducing me to music by women composers. Since that time, my path has taken me through the creation of a large folksong database, co-created with the journal, SingOut!, that indexes anthologies of folksong collections, publishing two reference books on African-American spirituals, and I’m working on a third. I feel blessed that I had the faculty trifecta of Paul Hollinger, Ernestine Whitman, and Marjory Irvin along with Dean Colin Murdoch to launch me on my way and teach me, in the Lawrence way, to engage, develop multiple interests, and give back to my community. You can read Kathy’s honor’s project in Lux, our institutional repository. My path to librarianship has felt fluid and fated in many ways. With a multidisciplinary approach to a career in libraries, it is no wonder Lawrence has had such a huge impact on my path. I have always been a lover of books, spending much of my childhood and adult life immersed in literature and libraries. But it was fateful day at Lawrence University that set my sites on the world of books as my career. That day Julie Lindemann and Johnie Shimon took my Intermediate Photography class to the LU Archives, I place I had never stepped foot in throughout my previous time at Lawrence. Erin Dix, the University Archivist, had brought out a collection of glass plate slides for our class to look at and study. She talked about the primary sources overflowing the archives and the unique ways such collections came to their Lawrence home. The best way I can describe that experience of being surrounded by history in those archives… wonderment. The glass slides tapped into a nostalgia and appreciation so deep it became a day and experience I would ever forget. But that day came and went. While memorable and important looking back, I was not as sure of what I wanted out of life as I began wrapping up my time at Lawrence. After graduating in 2012 with a BA in English and a minor in Studio Art, I spent two years moving around, trying different jobs, and feeling incredibly unsatisfied. And I know I cannot be the only one to have these post-graduation blues and trials. After lots of ups-and-downs in my career path (mostly downs it seemed like at the time), I decided to tap back into that day in the archives. If I could not access a fulfilling career with the credentials I had, it was time to change those credentials. I applied to six different library programs throughout the United States, and subsequently visited three in person. And to assist in learning more about libraries and archives while I applied, I went back to Lawrence to volunteer with Erin Dix in the University Archives. I loved having an excuse to visit campus each week, and loved even more the amount of skills and information I was able to learn from Erin while I worked with her. I ended up with an acceptance letter to the top library program in the country, in a small town I had never heard of prior to sending in my application, the Graduate School of Library and Information Science at the University of Illinois at Champaign-Urbana (yes, quite the mouthful). But it was not just the high credentials of the program that drew me to UIUC. My in-person visit assured my of the breadth and depth the program had to offer. Not only would I leave after two years with my Master of Science in Library and Information Science (MSLIS, we library-folk love our acronyms), but I could do it by catering the program to my interests in the fields (there is that multidisciplinary approach coming back in). On top of the academic love for the program I was just accepted to, I also received a Graduate Assistantship in Conservation. Now, I had never even heard of conservation, but what I learned brought back that archives-wonderment feeling. A job that blended books, archives, libraries, and art… yes, yes please. 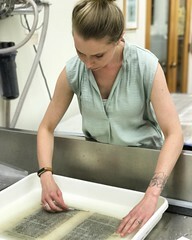 My experience in the conservation lab was nothing short of amazing. I was able to work alongside of incredibly talented and knowledgeable people in the field who offered me insight and training. I was able to work on historical items ranging from the papers of Gregor Mendel to an Ian Fleming collection and beyond. Gaining this incredible work experience alongside of a strong and vast library education gave my career-searching heart everything it was looking for and more. But graduate school comes to an end all too quickly, and so began a carer-hunt extravaganza. Months of applications, resumes, and cover letters took over any speck of free time that I had while finishing up my grad program. 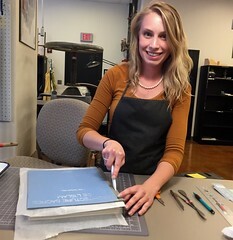 All that work paid off when I took on my current job at the Newberry Library in Chicago as their Conservator for Special Projects. At the Newberry I am greatly involved in the treatment and preparation of the many items that go on exhibit every year, while also continually working on treatment for the vast and varied collections the library houses. (Seriously, these collections are amazing. Next time you are in Chicago, stop by for a visit, the Newberry is free and open to the public, that means you!) Honestly, it is a dream job. It blends my interests of literature and art perfectly. Every day I go to work the library offers new and interesting challenges that bring amazing historic items across my bench. And it is a career that means I will be continually learning—learning new treatments, seeking new insights from other professionals in the field, researching collections and their uses in the library—which means my career will be a constant source of inspiration and enjoyment. When I started my education at Lawrence I did not foresee where it would lead me, but as I look back from my bench at the Newberry I see a clear path of how I got here. Libraries have so much to offer, and I hope that there are many future librarians sitting in Lawrence’s classes today. The annual winter break closure is quickly approaching, so be sure to get to the Mudd Library to pick up your books, movies, music, and scores to help you prepare for winter term (or catch up on the fun stuff). 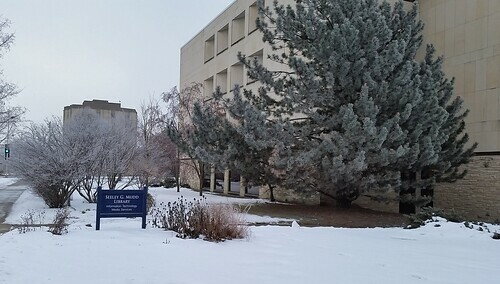 The Mudd Library will be open 8 a.m. to 4:30 p.m. through Friday, December 22nd. We’ll be closed from December 23rd through January 1st. We look forward to seeing everyone in the library again on January 2nd when we reopen from 8 a.m. to 4:30 p.m. Regular academic year hours resume on January 3rd (the first day of winter term). We hope everyone is enjoying the winter holidays and having a safe and relaxing winter break. NOT will omit a word from your search results. Use this with caution as it can sometimes omit potentially useful resources. “Phrase searching” will ensure words are searched in a certain order, next to one another. These strategies are often referred to as Boolean Searching, though there are some slight variations. For more search tips, see the “learn more about searching” document.